It turns out that Italian food is anything but Italian. It is, instead, deeply regional. Unlike most of its European neighbors, Italy was somewhat late to the game of national unification, becoming Italy more or less as we know it today in 1861. Before then, it was divided into many reigns and republics, each with its own administration, currency, language and history. Even now, traditions, dialects and accents, natural and architectural landscapes and, of course, foodways vary greatly from region to region. From Aosta in the north to Sicily in the south, regional foods reflect the shared culture of generations who are rooted to the towns and countryside of their piece of Italy. Ligurians are especially proud of their pesto alla Genovese, Umbrians are devoted to black truffles, and Campania is known for its mozzarella di bufala. The list goes on and on, and everyone you meet in Italy will be happy to expand on this theme. 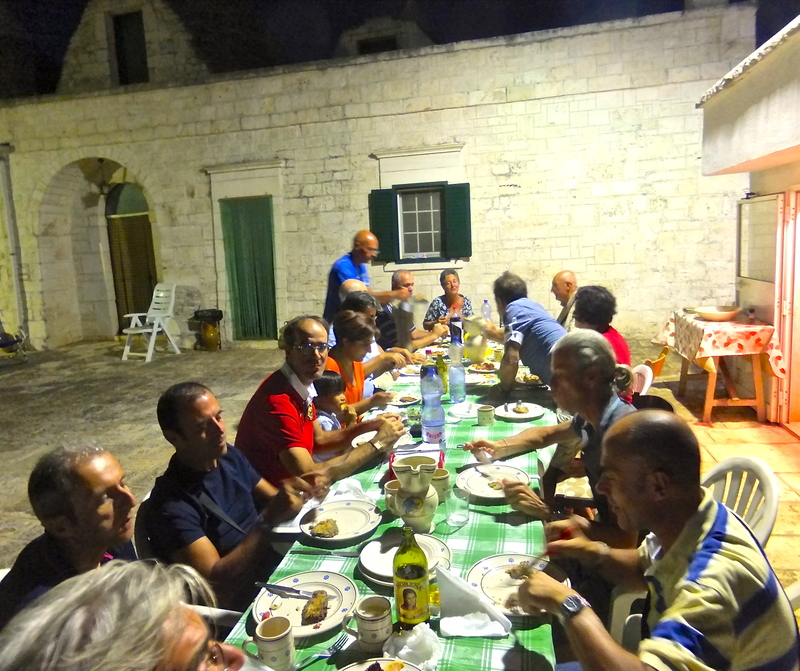 While there are generalizations—northern Italians tend to prefer rice, polenta and butter while southern Italians are partial to pasta and use olive oil almost exclusively—the significant differences from region to region and town to town reflect the cultural identities of their residents. In this way, the extraordinary bounty of Italian cuisine lies in its rich diversity. In Puglia, I have yet to meet anyone who doesn’t want to share the right way to prepare Fave e Cicoria or Puree of Fava Beans with Bitter Greens, an iconic dish in our town if there ever was one. Fave e Cicoria is a dish born of poverty. While meat was scarce in these parts—strictly a Christmas and Easter luxury even fifty years ago—beans were plentiful and olive oil was then, as now, ubiquitous. There has been a return to these good old recipes in recent times, probably because they nurture the soul as well as the body. There are, it seems, as many variations on this dish as there are cooks who produce it. To me, the differences are subtle, but not to my many teachers. These friends want to make sure I get it right, so copying down an oral version of the recipe is never enough. It seems I must observe the process first hand, which I’ve now done half a dozen times. It is never exactly the same, but it is always exquisite. While the food is distinctly different in every corner of Italy, there is universal agreement on one principle only. Wherever you go up and down the peninsula, the right way to make every dish is the way mamma makes it. 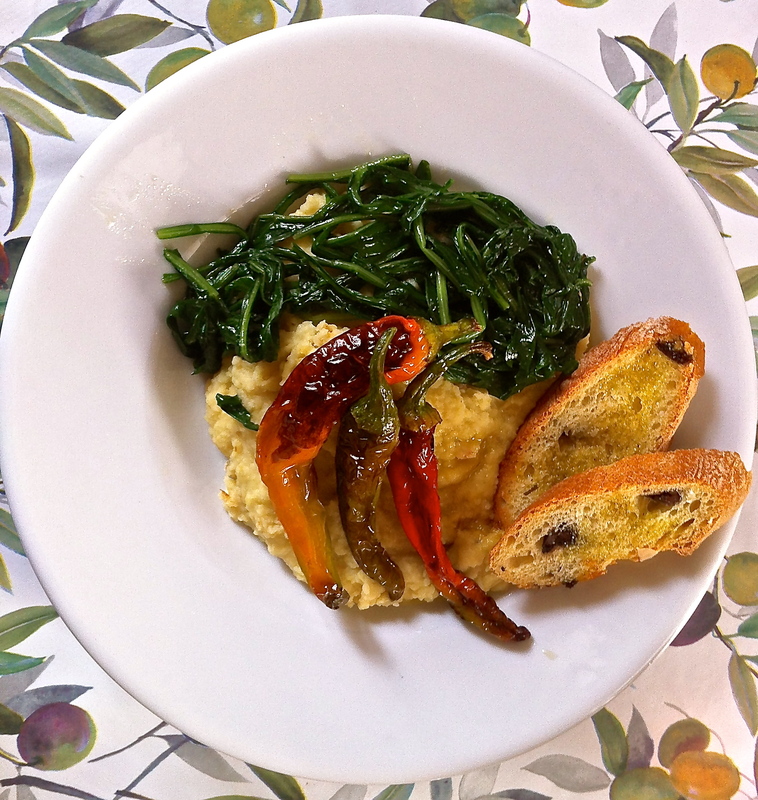 Here’s just one recipe for Fave e Cicoria, also known as my husband’s favorite dish. While it’s served as a first course in Italy, it makes for a hearty vegetarian/vegan entrée and is especially satisfying both in terms of flavor and texture. Soak the beans in cold water overnight. The next day, drain and rinse them, removing any stray skins or other interlopers. Put them in a deep saucepan with the potato and the onion (something with a thick base like Le Creuset or cast iron is great for this), cover them with cold water and place over a fairly high flame. As the beans start to cook, they will give up an alarming amount of frothy white foam, which you should skim off as soon as it appears. Once the foam starts to disappear, add salt to taste and reduce the heat. The beans will simmer happily and you should stir them with a wooden spoon from time to time, adding additional hot water if they seem like they might scorch. Towards the end of the cooking time, the beans will have lost their shape completely and you will have to stir frequently. This whole process takes about an hour, but the time varies based on the freshness of the beans. Remove the beans from the heat and pass them through a passatutto or food mill. Avoid the food processor or the blender. These appliances tend to create a slick and gloppy puree that isn’t anything like mamma makes. If you don’t have a food mill, whip the beans with a whisk or mash them enthusiastically with a potato masher. As you pass, whip or mash, add the best quality extra virgin olive oil you can find. Taste the puree. It should be earthy, with a heavenly aroma of extra virgin olive oil emanating from it. Keep the puree warm while you attend to the accompaniments, or have your kitchen helpers manage them while you focus on the fava beans. Inspect the bitter greens for tough stems, removing them if they are especially thick. With kale, for example, remove the center stalks if they are fibrous. Bring a big pot of water to a boil, add salt to taste and plunge the bitter greens into it. If you think the greens are just too bitter (although their bitterness serves as a foil to the unctuous bean puree), add a slice of lemon to the boiling water before you add the greens. If the greens are tender, they’ll be ready to drain in about 8-10 minutes. Taste them to be sure. Drain them into a colander, pour then into a serving bowl and dress them with extra virgin olive oil, salt and freshly ground black pepper. Meanwhile, pour a few tablespoons of extra virgin olive oil into a skillet over medium high heat and drop the green Italian peppers into it. Let the peppers brown a little, then reduce the heat and cover the skillet. After 5-10 minutes, turn the peppers over to brown their other sides. Drain the peppers on a paper towel, salt them and serve them alongside the bitter greens. Serve the fava bean puree in pasta bowls with a thin stream of extra virgin olive oil on the top. Pass the bitter greens and the peppers, which are placed right on top of the puree. Each bite of the puree is accompanied by a swirl of bitter greens or a bite of pepper. Some Pugliese cooks serve Fave e Cicoria with grilled slices of semolina bread that have been rubbed with a cut garlic clove and drizzled with more extra virgin olive oil. Did I mention that Puglia is the largest producer of olive oil in Italy?